For the community in California, see Scheelite, California. Scheelite is a calcium tungstate mineral with the chemical formula CaWO4. It is an important ore of tungsten (wolfram). 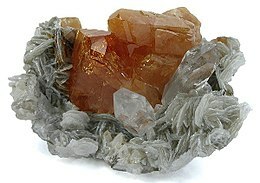 Well-formed crystals are sought by collectors and are occasionally fashioned into gemstones when suitably free of flaws. Scheelite has been synthesized using the Czochralski process; the material produced may be used to imitate diamond, as a scintillator, or as a solid-state lasing medium. It was also used in radium paint in the same fashion as was zinc sulphide, and Thomas Edison invented a fluoroscope with a calcium tungstate-coated screen, making the images six times brighter than those with barium platinocyanide; the latter chemical allowed Röntgen to discover X-rays in early November 1895. Fluorescence under short-wave UV is bright blue, bluish white to yellow. Specimens with more molybdenum tend to fluoresce white to yellow, similar to powellite. Occasionally fluoresces red under mid-wave UV. Its crystals are in the tetragonal crystal system, appearing as dipyramidal pseudo-octahedra. Colors include golden yellow, brownish green to dark brown, pinkish to reddish gray, orange and colorless. Transparency ranges from translucent to transparent and crystal faces are highly lustrous (vitreous to adamantine). Scheelite possesses distinct cleavage and its fracture may be subconchoidal to uneven. Its specific gravity is high at 5.9–6.1 and its hardness is low at 4.5–5. Aside from pseudo-octahedra, scheelite may be columnar, granular, tabular or massive in habit. Druzes are quite rare and occur almost exclusively at Zinnwald, Czech Republic. Twinning is also commonly observed and crystal faces may be striated. Scheelite streaks white and is brittle. Gems cut from transparent material are fragile. Scheelite's refractive index (1.918–1.937 uniaxial positive, with a maximum birefringence of 0.016) and dispersion (0.026) are both moderately high. These factors combine to result in scheelite's high lustre and perceptible "fire", approaching that of diamond. Scheelite fluoresces under shortwave ultraviolet light, the mineral glows a bright sky-blue. The presence of molybdenum trace impurities occasionally results in a green glow. Fluorescence of scheelite, sometimes associated with native gold, is used by geologists in the search for gold deposits. Scheelite occurs in contact metamorphic skarns; in high-temperature hydrothermal veins and greisen; less commonly in granite pegmatites. Temperature and pressure of formation is between 200 and 500 °C and from 200 to 1,500 bars. Typical mineral association includes cassiterite, wolframite, topaz, fluorite, apatite, tourmaline, quartz, grossular–andradite, diopside, vesuvianite and tremolite. Scheelite usually occurs in tin-bearing veins; and is sometimes found in association with gold. Fine crystals have been obtained from Caldbeck Fells in Cumbria, Zinnwald/Cínovec and Elbogen in Bohemia, Guttannen in Switzerland, the Riesengebirge in Silesia, Dragoon Mountains in Arizona and elsewhere. At Trumbull in Connecticut and Kimpu-san in Japan large crystals of scheelite completely altered to wolframite have been found: those from Japan have been called “reinite.” It was mined until 1990 at King Island, Australia, Glenorchy in Central Otago and Macraes Flat in North Otago and also at The Golden Bar mine at Dead Horse Creek during World War 1 in Nelson, New Zealand. There is a high concentration of Scheelite in Northeast of Brazil, mainly in the Currais Novos mine in Rio Grande do Norte State. 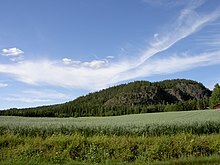 Scheelite was first described in 1781 for an occurrence in Mount Bispbergs klack, Säter, Dalarna, Sweden, and named for Carl Wilhelm Scheele (1742–1786). Owing to its unusual heaviness, it had been given the name tungsten by the Swedes, meaning “heavy stone.” The name was later used to describe the metal, while the ore itself was given the name scheelerz or scheelite. Although it is now uncommon as a diamond imitation (much more convincing products, like cubic zirconia and moissanite have long since superseded it), synthetic scheelite is occasionally offered as natural scheelite, and collectors may thus be fooled into paying high prices for them. Gemologists distinguish natural scheelite from synthetic material mainly by microscopic examination: Natural material is very seldom without internal growth features and inclusions (imperfections), while synthetic material is usually very clean. Distinctly artificial curved striae and clouds of minute gas bubbles may also be observed in synthetic scheelite. The visible absorption spectrum of scheelite, as seen by a hand-held (direct-vision) spectroscope, may also be of use: most natural stones show a number of faint absorption lines in the yellow region of the spectrum (~585 nm) due to praseodymium and neodymium trace impurities. Conversely, synthetic scheelite is often without such a spectrum. Some synthetics may however be doped with neodymium or other rare-earth elements, but the spectrum produced is unlike that of natural stones. ^ Klein, Cornelis and Cornelius S. Hurlbut, Manual of Mineralogy, Wiley, 20th ed., 1985, p. 356 ISBN 0-471-80580-7. ^ Zalkin, A.; Templeton, D.H. (1964). "X-ray diffraction refinement of the calcium tungstate structure". Journal of Chemical Physics. 40: 501–504. doi:10.1063/1.1725143. Chisholm, Hugh, ed. (1911). "Scheelite" . Encyclopædia Britannica (11th ed.). Cambridge University Press. ^ Amstutz, Gerhard Christian et al. (Ed.). Ore Genesis: The State of the Art. Vol. 2. Springer Science & Business Media, 2012, p. 418. Reynolds, Francis J., ed. (1921). "Scheelite" . Collier's New Encyclopedia. New York: P.F. Collier & Son Company. Look up scheelite in Wiktionary, the free dictionary. Wikimedia Commons has media related to Scheelite.